Updated 7.10.2010 Francesco “Franco” Sabatini made bicycles in Perugia, Italy at home up until 1987. He handmade each one with his wife who did the decals and built up the wheels ... According to his daughter, Claudia, he knew he needed help (sons) with the business, but soon learned that he would be working with a daughter. He ended up with three daughters ... but they were all very enthusiastic about the business. 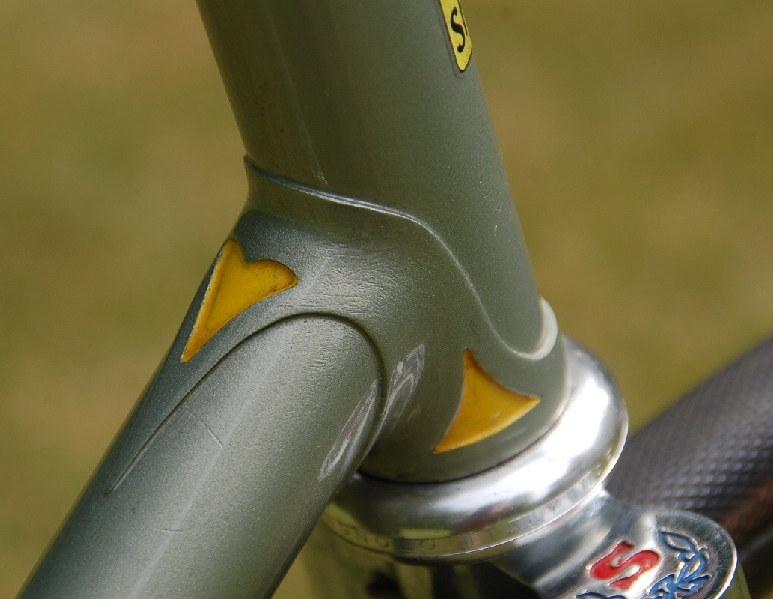 All of Sabatini’s bikes were made with Columbus tubing and Campagnolo components, mostly Super-Record. The higher end bikes were all pantographed. In 1978-79 a Canadian bicycle shop (International Cycling) told him he would buy many of the bikes (about 30). Sabatini built all of them by hand and sent them to Canada in two shipments. .. the first order of about 10 bikes was immediately paid ... the other 20 bikes was never paid and he was never able to get the money. There were never any other shipments abroad and Sabatini never shipped a single bike to the United States. Many of the bikes we see here are a part of those original 30 Canadian bikes of which most were never paid for. features including slots cut in fork blades & seat stays.